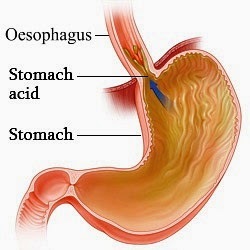 A valve at the top of the stomach prevents acid from leaving the stomach. If this valve isn't functioning properly, or the pressure on the stomach is too great, acid is forced up into the gullet - reflux - and irritates its sensitive lining. It may be known as reflux oesophagitis, indigestion or waterbrash. * Burning pain behind the breastbone that may travel up to the neck. * A taste of acid in the back of the throat or mouth. These symptoms often start after a meal and are worse when bending over or lying flat. Other symptoms include chest pain, difficulty swallowing food, coughing or wheezing. Up to four in ten people have heartburn each year in the UK. Some have it occasionally, while others suffer every day. Heartburn usually occurs as people get older. Those who are overweight, pregnant, smoke, overeat or wear tight clothes are more likely to experience heartburn, as are people with hiatus hernia. . It is more common if you use certain medications such as ibuprofen. Maintaining an ideal weight, not overeating, not eating within a few hours of going to bed, not smoking and wearing loose clothing can all help in the prevention of heartburn. Reducing alcohol intake and the amount of spicy foods you eat may help. Making the lifestyle changes described above is important in treating this condition. Raising the head of the bed helps, as do low-fat, milky drinks. Antacids to neutralise the stomach acid, medicines that float on top of the stomach acid or drugs that reduce the amount of acid produced by the stomach may be recommended. Sometimes surgery is needed to repair the stomach valve if lifestyle changes and medication aren't controlling the symptoms.